I've been planning a blog re-design for quite some time and I was getting to a point where I didn't feel excited about my blog. There were so many issues with the previous blog design that, in all honesty, I didn't have the energy to try and fix. The thing is, there's so much I want to share on SSL, almost too much and I often feel slightly overwhelmed by my plans and visions. Pipdig has been on my radar around the time I properly launched SSL last October, but I had already purchased a design elsewhere and decided to wait for a beautiful pipdig design. The time finally came several weeks ago and I've since been fiddling around with various html coding (and tearing my hair out at the same time!). So, voila! What do you think? Have a play around - those magic little drop down menus at the top of the page have been the bane of my life. I'm sure there'll be sneaky little changes every once in a while, and a few things still need to be smoothed over. However, I'm totally in love with the design, and I hope you are too, hooray! Last Sunday, I rustled up James and I a lovely lemon, garlic and rosemary free-range roast chicken after a long weekend at work. I hadn't ever roasted a proper chicken before, only poussin, but it was super easy and one chicken can easily go a long way. It was served with a large green salad with homemade dressing, and herby, buttery new potatoes. I've really been enjoying seriously nutrient dense meals this week so my Nutribullet has been going to good use with all the smoothies I've been making. I also treated myself to a Beyond The Kale lunch on Friday - Vegan Falafel Wrap with tonnes of salad and dressings, plus a sneaky Caramel Slice which was essentially a raw, Vegan millionaire's shortbread. A lot of the people I work with often say no one needs a gym membership when you work there, as you're honestly running up and down flights of stairs a billion times a day, plus you're generally on your feet all day too. I haven't had the time or energy to do a YouTube workout video, or get out and about and just go for a long walk. We're off to Brighton tomorrow morning however and I'm sure we'll be doing lots of walking and exploring there. 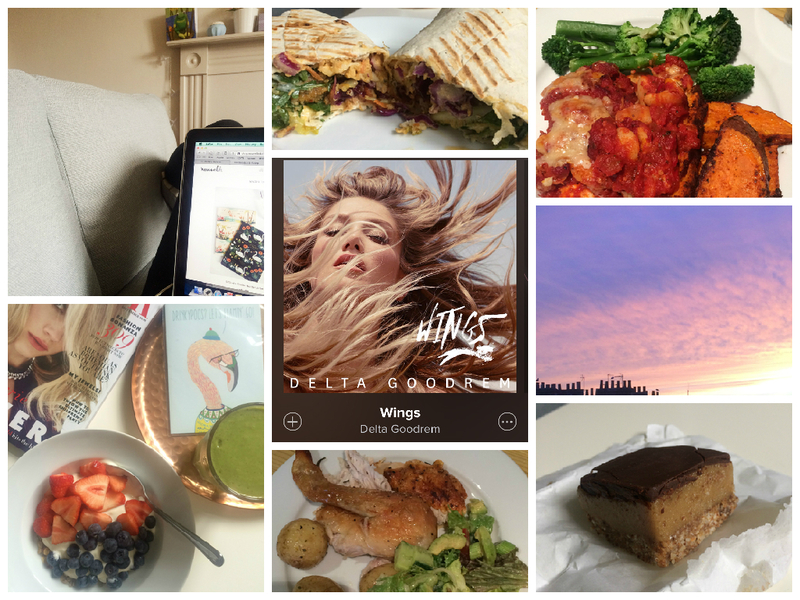 Jemma's post about kicking those sugar cravings to the curb, but still enjoying it is EVERYTHING. A very refreshing, realistic take on the whole sugar debate. 10 Things I Wish I Knew When I Was 22. I think I need each point stuck around the flat for daily reminders. Do you think I could just pack everything in, hire a little car and take a never ending road trip around Europe to discover these pretty little villages? ...also, she totally hit the nail on the head about the current and future climate of blogging and women's lifestyle magazines. Kate's finally launched her G O R G E O U S new stationary shop and oh my, is it love. I need this mint and gold planner to come back in stock, please. I'm totally obsessed with Nina Tucker Delta Goodrem's song Wings. It's seriously cheesy but, who cares, it's catchy as hell and she could totally pass as being Rosie Huntington Whitely's sister in the music video. Billboard get a high five from me after this post about why some of my favourite singers such as Carly Rae Jepsen and Marina and the Diamonds are unfairly underrated. The beautiful sunset we were lucky to experience a few nights ago. Those pastel hues just do it for me! Jen - you are brilliant. I loved this seriously relatable piece from Jen where she admits she's finally learnt how to budget at 29 (and a half). I have hope! Madeleine has written about the importance of carbohydrates and how beneficial the right carbs can be. What do you think of the all new She's So Lucy? Do you love it?! What have you been loving this week? Have there been any delicious new meals or recipes you've been experimenting with? How do you feel about buying new beauty products? Let me know how your week has been, and I hope to hear from you again soon.